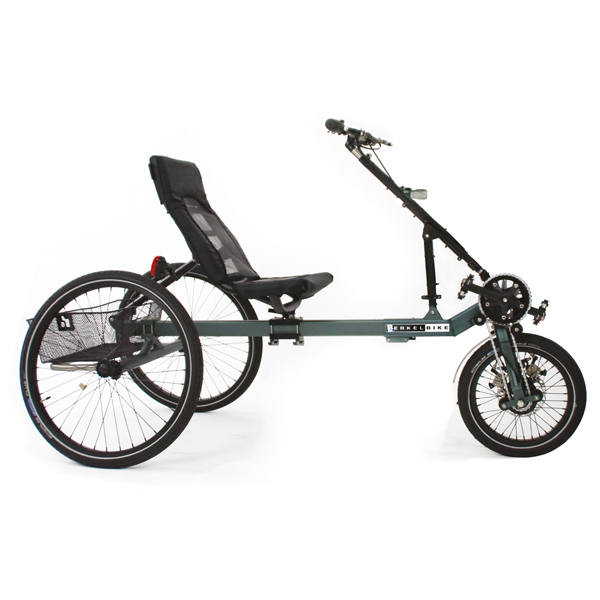 The BerkelBike Pro is a combination of a handbike and a recumbent bike. It combines arm and the leg movements to power the bike; the arm pieces are connected through a chain to the leg parts. If you move the handles, the foot pedals move as well. WANT TO TEST THE BERKELBIKE PRO YOURSELF? HOW DOES A BERKELBIKE PRO WORK? The leg movement is supported by the strength in the arms and shoulders. This allows the legs to move in a full circle, even if they have lost a significant amount of strength and coordination. The effort is distributed evenly over all the limbs; this means tired body parts can rest. Biking on the BerkelBike is considered a full body training and focusses on both the well-functioning body parts and those with reduced function. 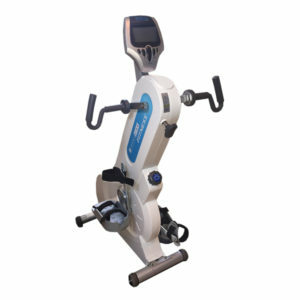 Additionally, in the case of a spinal cord injury or another neurological condition, the bike can be combined with electrical stimulation to ensure that legs with little or no function will also be trained. WANT TO KNOW MORE ABOUT THE BERKELBIKE PRO? WHAT IS THE ADDED VALUE OF A BERKELBIKE IN MY SITUATION? Lisa Green has been a fanatic athlete for years until she was diagnosed with MS in 1998. After this diagnosis, training became increasingly difficult for her. Many BerkelBike users suffer from various medical conditions and use it mainly to improve their health. 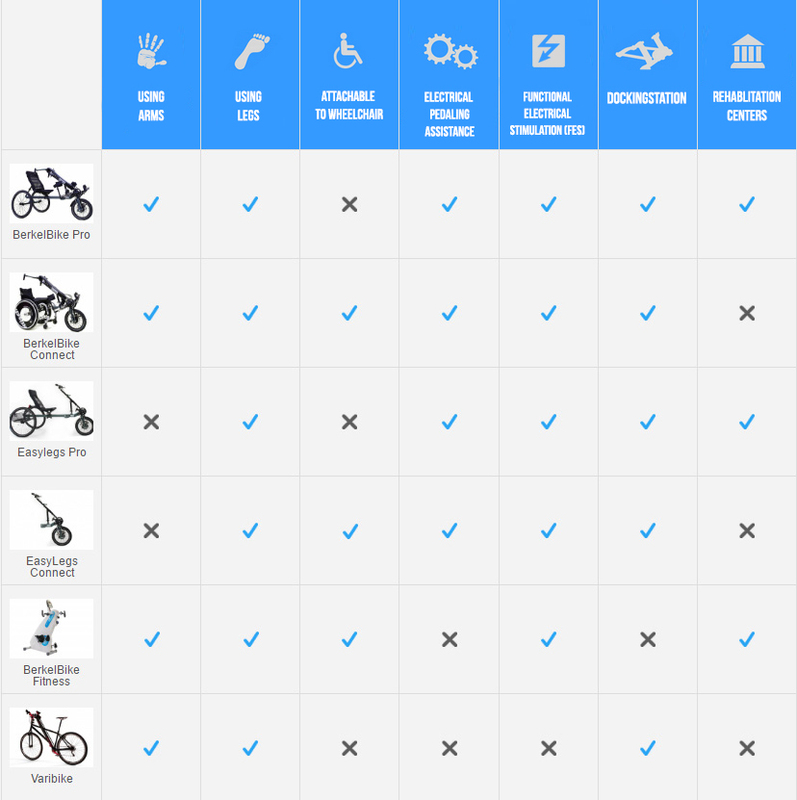 The most common disabilities among BerkelBike users are spinal cord injuries, multiple sclerosis, amputations, and brain injuries. The BerkelBike was developed in cooperation with physicians, therapists, and researchers from rehabilitation centers in the Netherlands. It can be incorporated in physiotherapy programs intended to help the patient regain strength and motion in impaired legs. 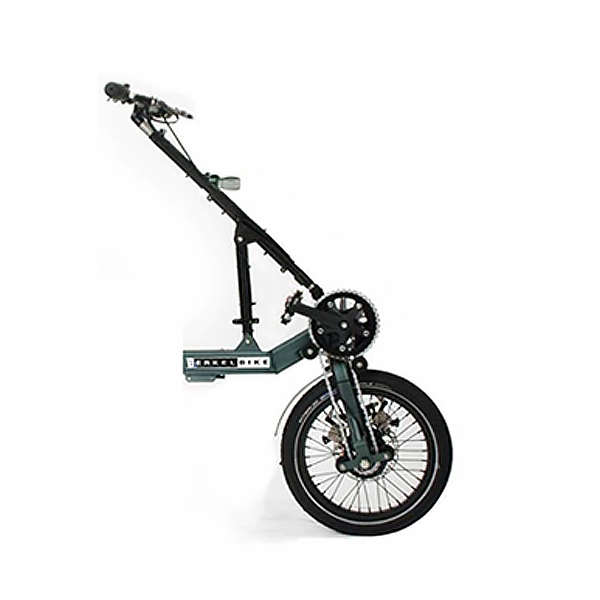 During 20 minutes of cycling with the BerkelBike, each leg is bent about 1,000 times. If the legs struggle at moving by themselves, the passive movement alone can improve the blood circulation in your lower extremities. Lizzie has always been sporty, but unfortunately, she was involved in an accident where a car with trailer bumped into her. After her recovery, she wanted to keep exercising, but with her first FES bike she could not cycle outside or get a full body training. Instead, she decided to buy a BerkelBike, which allows her to bike whenever she feels like it. She cycles two to three times a week on the BerkelBike, alongside other activities. People suffering from a spinal cord injury can use the BerkelBike in combination with our FES-Box to enhance muscle mass and blood circulation thereby preventing further problems associated with muscular inactivity in legs and buttocks. Thanks to the FES system, the user will be able to bike using the remaining power of their own legs and arms. 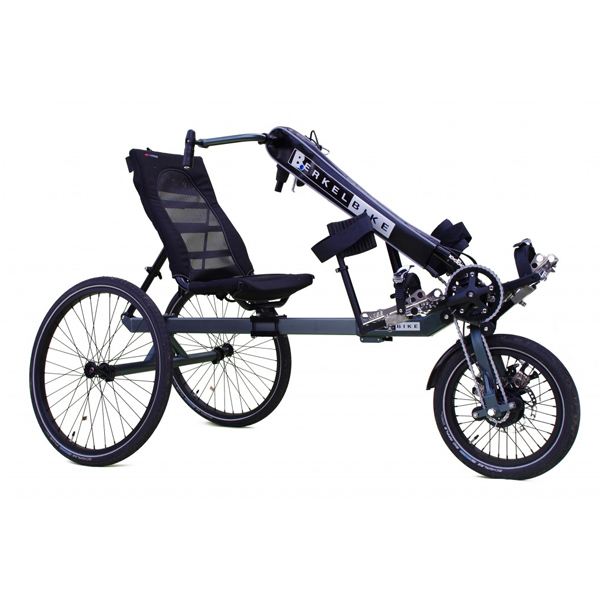 It is also possible to purchase our wheelchair connector and use the front part of the BerkelBike Pro to convert your own wheelchair into a hand- and leg-driven trike (see BerkelBike Connect). Luke Sinnott served as a captain and worked in the explosives cleanup service in the province of Helmand, Afghanistan. During a mission he stepped on a bomb that severed both his legs. “It felt like my whole life was flowing out of my body”, he said. “I thought about home and didn’t want to die like this.” Using the BerkelBike, Luke can easily cycle with his walking prostheses. He is still very excited about this solution to his mobility problem. Luke is one of the British athletes who participate in the World ParaAthletics Championships 2017 in London. He can easily bike using the BerkelBike with his walking prosthetics. Luke got to know the BerkelBike on a trade fair and was one of the first BerkelBike users with an Aluminium frame in England. Years later, he is still very excited about this solution to his mobility problem. THE BERKELBIKE PRO OR THE BERKELBIKE CONNECT? The BerkelBike is available in two versions: Pro and the Connect. The Pro is comparable to a three-wheel recumbent, while the Connect is a single-wheel extension that you connect to your wheelchair to transform it into a full three-wheeler. The BerkelBike Pro was developed to bike long distances at high speed. It is light, has little resistance during cycling, and the wide wheelbase with a 9-degree frame curve provides extra stability. The seat height is easily adjustable without tools; high for a good overview or low for better stability. The latter is particularly important when it comes to taking turns at high speed without tilting. People with limited mobility in the hips or people with overweight can sit comfortably by tilting the backrest downwards. It is also possible to adjust the rear axle position to suit personal preference. Positioning the rear axle rearwardly results in greater pressure on the front wheel, making it less slippery and allowing the user to cycle safely uphill. Positioning the rear axle more towards the front, reduces the turning circle of the bike and provides easier maneuverability in the city. Photo: BerkelBike PRO (Left) en BerkelBike Connect (Right). 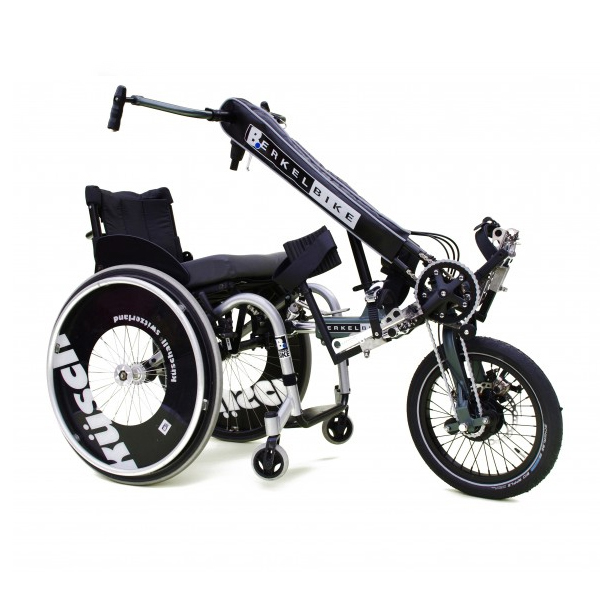 The BerkelBike Connect has been developed to attach to a wheelchair so that the user does not have to transfer to the bike. This renders the Connect especially convenient for social and daily activities such as shopping, visiting friends and taking a ride in the park. It is smaller than the Pro and therefore even easier to transport and store. The Pro can easily be disassembled without tools so that it fits into the car. You do not need to buy a new bike if you want to use the BerkelBike Pro instead of the Connect or vice versa. If you have already purchased the Connect, you only need to purchase the back part of the Pro. If you already have the Pro, you only need to purchase the connector to link the front part of the Pro to your wheelchair. If you want both, you can buy the Connect together with the back part of the Pro. You can then transform the Connect into the Pro without using any tools.